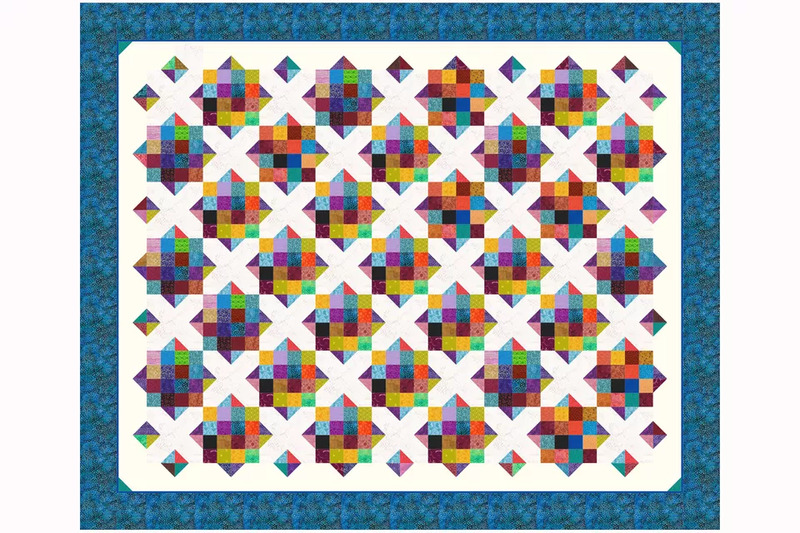 Field of Diamonds is an easy scrap quilt pattern designed with a combination of two traditional quilt blocks, the Sixteen Patch block and a block most commonly called X, even though it's known by other names. 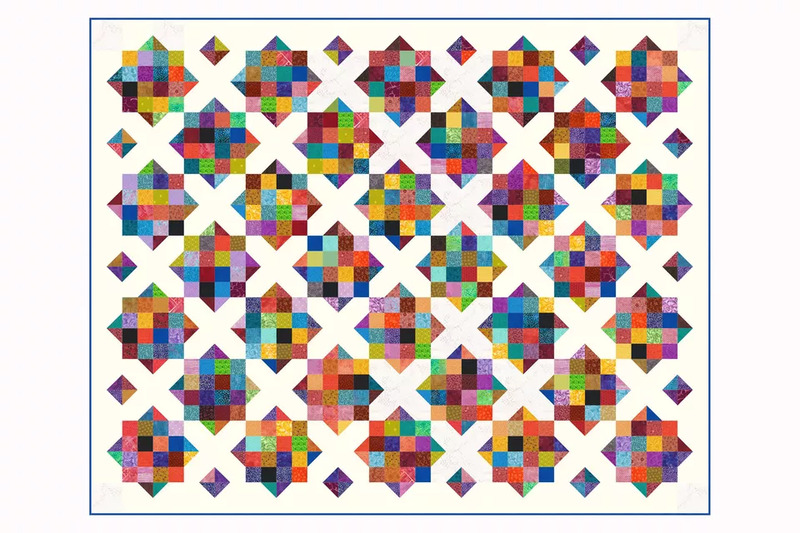 A patchwork border extends beyond the outer blocks to continue the peaked extensions that are connected to the sixteen patch quilt blocks. The quilt finishes at about 56" x 72". Increase its size by adding one or more borders to the quilt or by sewing additional quilt blocks. The example quilt has a white background. I do recommend that you use the same background throughout the quilt to provide a constant backdrop, but the color needn't be white. You might choose to change color value (contrast) entirely and sew with a very dark background as shown on page 8. This quilt is very scrappy but you can create a theme. You could even choose light to dark fabrics of the same color to create a monochromatic quilt. You might opt to sew the quilt over time, accumulating the blocks or pieces for blocks as leftover fabrics are available. Scrap quilts are all about variety so don't obsess over color and color value placement when you sew components together. Work with a variety of fabrics and throw a bit of black into the mix to add depth. No matter how you construct them, the Sixteen Patch blocks have lots of seams. That means you must use an accurate quarter inch seam allowance or your blocks will be too small (typical) or too large (less likely). Why are seam allowances important? 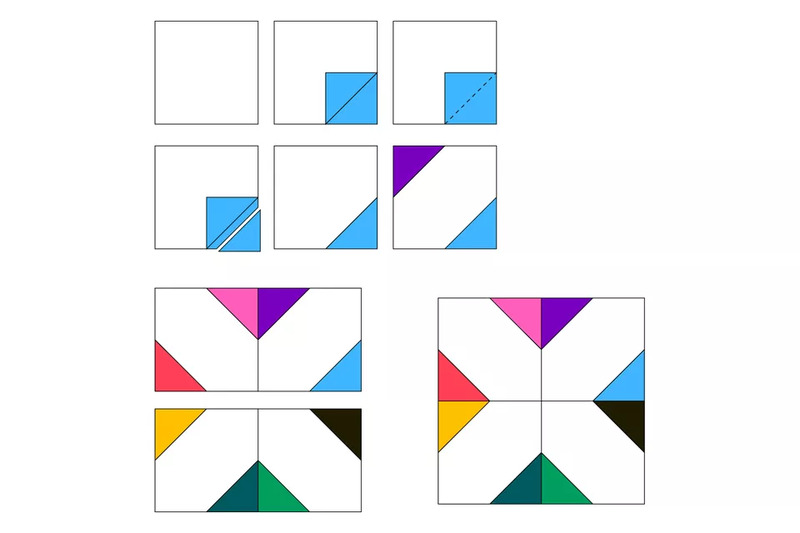 Because the Sixteen Patch blocks sit right next to X blocks with far fewer seam allowances, making the X blocks less likely to be off-sized or skewed. Test your seam allowance and you might find that you need to sew Sixteen Patch block with a 'scant' (narrower) quarter inch seam. Cut carefully and press and measure as you work so that all blocks and the patchwork border fit together just as they should when it's time to assemble the quilt. If the colorful fabrics in each block are identical you would need about 4 yards. Use that figure as a guide when searching for scraps in your fabric stash. If you're short, consider buying fat eighths or fat quarters to accumulate a variety of fabrics. A panel about 66" x 72" or as required by the quilter if you are sending it out to be quilted. Yardages vary depending on backing configuration. Learn how to make quilt backing. A panel about the same size as the backing. About 285 running inches of continuous double fold binding to finish at 1/4". Since the quilt has a border on its outer edges you could use a wider binding but take care to follow correct mitering instructions for binding sewn to the quilt with a wider seam allowance. Cut (124) 4-1/2" x 4-1/2" background squares. I recommend that you cut enough squares to make one or two test quilt blocks before cutting all of your fabric. Each X quilt block is made up of four quick pieced patchwork units. Follow the diagrams left to right and top to bottom as you work. Draw a line from one corner to the opposite corner on the reverse side of each 2-1/2" x 2-1/2" square. Position a marked square in one corner of a larger square, right sides together, with the marked line as illustrated. Make sure the edges of both fabrics match. Secure with a straight pin if necessary. Sew a seam directly on the marked line. Trim with scissors or a rotary cutter, leaving about 1/4" for a seam allowance. Repeat on the opposite diagonal with another small square. Press as is to set the seams. Carefully press the seam allowances towards the new triangles. The square should still measure 4-1/2" x 4-1/2". Create three more squares, but use an assortment of colorful fabrics. 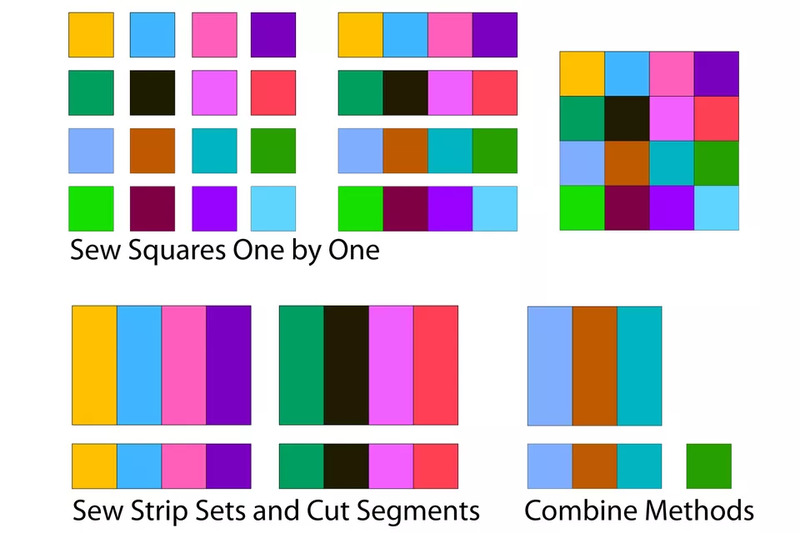 Arrange the four squares into two rows -- color triangles should meet as shown. Sew components of each row together. Press to set the seam and then press allowances in adjoining rows in opposite directions. Join the rows. Press the quilt block. It should measure 8-1/2" x 8-1/2". If it does not, check your pressing and cutting to determine why. Repeat all steps to sew a total of 31 X quilt blocks. The Sixteen Patch quilt blocks can be assembled in several ways. Refer to the illustrations. Sew (16) 2-1/2" squares together individually, making four rows of four squares each to create a block. You would need (512) 2-1/2" x 2-1/2" squares to sew all blocks from individual patches. Sew four 2-1/2" wide strips of fabric (any length) side by side to create a strip set and then cut 2-1/2" segments from the set to create multiple rows. Combine the two methods. Let's say you have three strips of fabric you'd like to use in a strip set. Sew the strip set and cut segments. Sew a 2-1/2" scrap square to one end of each segment to make the rows. Any combination of strips sets and individual squares will work just fine as long as you remember the 2-1/2" dimension. Create 128 rows of patchwork to create 32 Sixteen Patch quilt blocks. Each completed row should measure 2-1/2" x 8-1/2". Each completed quilt block should measure 8-1/2" x 8-1/2". It's fine to use a variety of 2-1/2" wide strips of fabric cut from selvage to selvage. Each strip set made from fabrics of that length would allow you to cut about (16) 2-1/2" segments. Avoid repeating like segments within the same block so that the duplication isn't noticeable. Another option is to sew two 2-1/2" wide long strips together to make a long strip set and then cut 2-1/2" segments. Add two individual 2-1/2" squares to the segment. Work with the fabrics you have on hand to create 32 scrappy quilt blocks from (128) segments/rows. Make a few test blocks and check their size before cutting all of your fabric. Completed blocks should measure 8-1/2" x 8-1/2". Square up one end of each strip set before cutting 2-1/2" segments. Ideally, seam allowances in adjacent rows should be pressed in opposite directions to make it easier to match the intersections. That probably won't be possible so match and pin the intersections before sewing. Use a design wall to preview blocks before sewing rows together. The quilt is illustrated in landscape mode -- on its side. 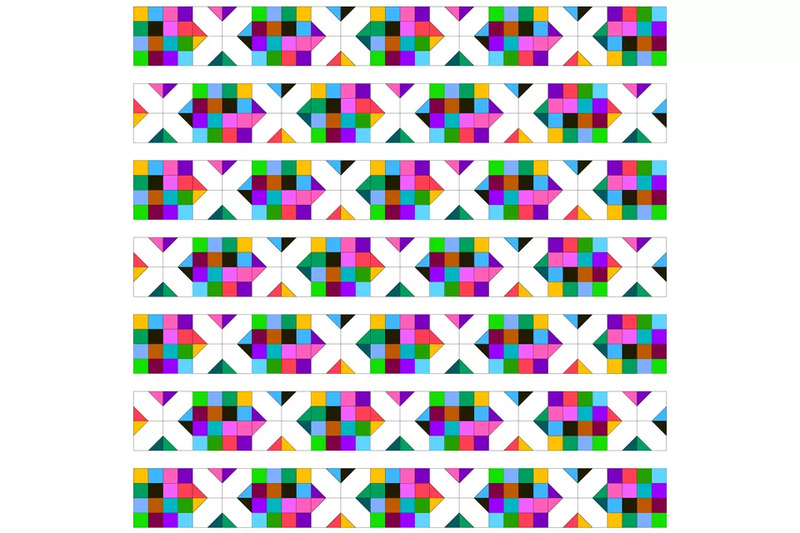 Print the image and flip it around if you prefer to visualize and work with shorter rows. Make sure all blocks measure 8-1/2" x 8-1/2" before you begin. If some do not, try one of my easy ways to fix problem quilt blocks before sewing them into the quilt. Use a design wall or other flat surface to arrange blocks if possible. Create seven rows for the quilt as shown above. Each row contains nine quilt blocks. Alternate block types from side to side and row to row. Rows 1, 3, 5, and 7 begin and end with a Sixteen Patch block. Remaining rows begin and end with an X quilt block. Join the blocks in each row. Press new seam allowances in opposite direction from row to row to make block intersections easier to match. Sew the rows together. Use pins to match and secure rows before sewing. Repeat some squares if you wish but try to make the assortment as scrappy as possible. 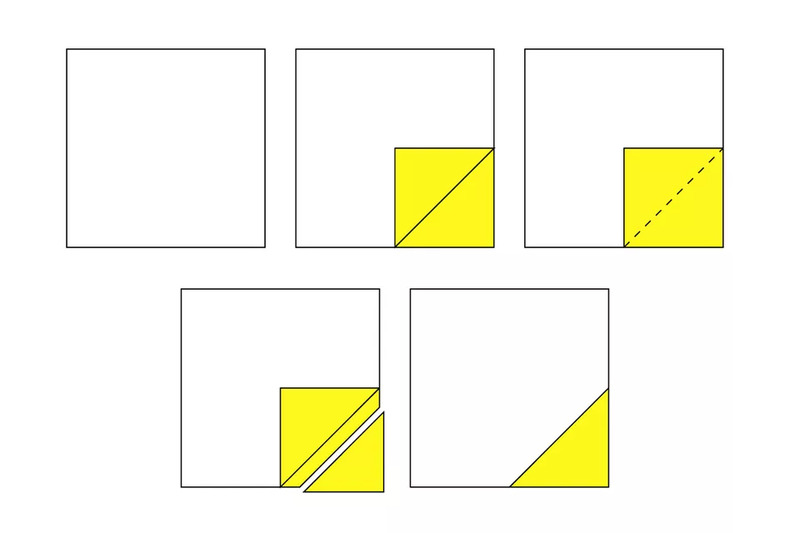 Draw a diagonal line on the reverse side of each small square, just as you did to make X blocks. Use the same quick piecing technique to sew one small square to one corner of 64 larger squares. Set the seams, trim, and press the triangle right side up as before. Set aside, along with the four remaining larger squares. 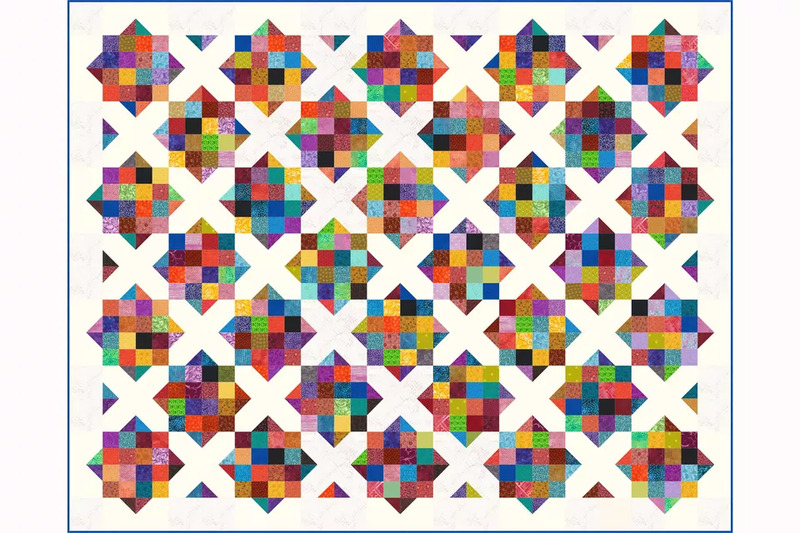 You could work with (mostly) rectangles to create the border but single patches sewn to individual squares offer more layout options when you design the quilt. Sew two borders of eighteen 4-1/2" patchwork border squares. Twist squares around to form the peaks illustrated. Press seams between border squares to best match the quilt. Sew each long border to the quilt as you would any other border, by matching and pinning endpoints and midpoints first and then matching and pinning remaining areas. Sew two more borders, each with fourteen 4-1/2" patchwork border squares. Sew a plain 4-1/2" background square to each end of each short border. Press as before and sew to the remaining sides of the quilt. Baste the quilt and quilt. Trim excess batting and backing, carefully squaring up corners and sides if they've become just a bit distorted. Sew easy mitered binding around the edges of the quilt. 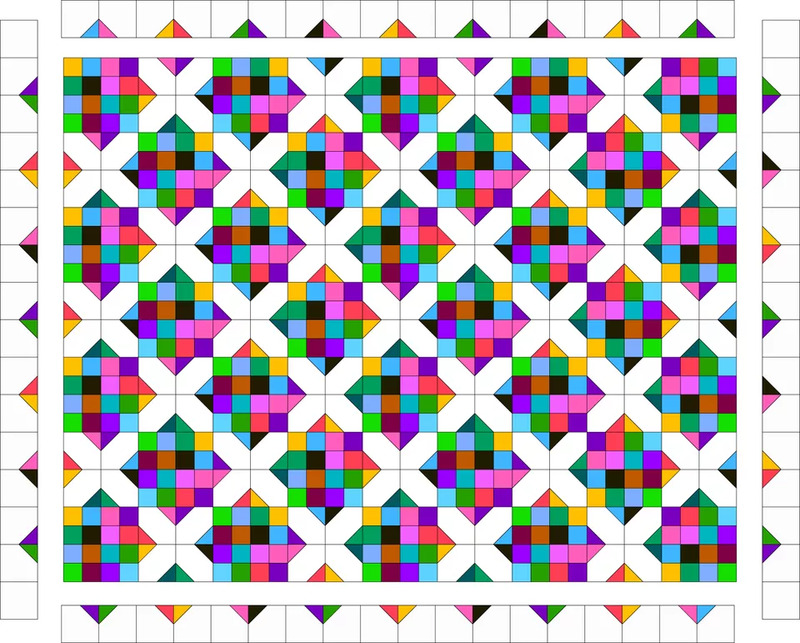 Here, the quilt block arrangement is reversed, with X blocks and Sixteen Blocks swapping places. A 5" border increases the quilt's size. 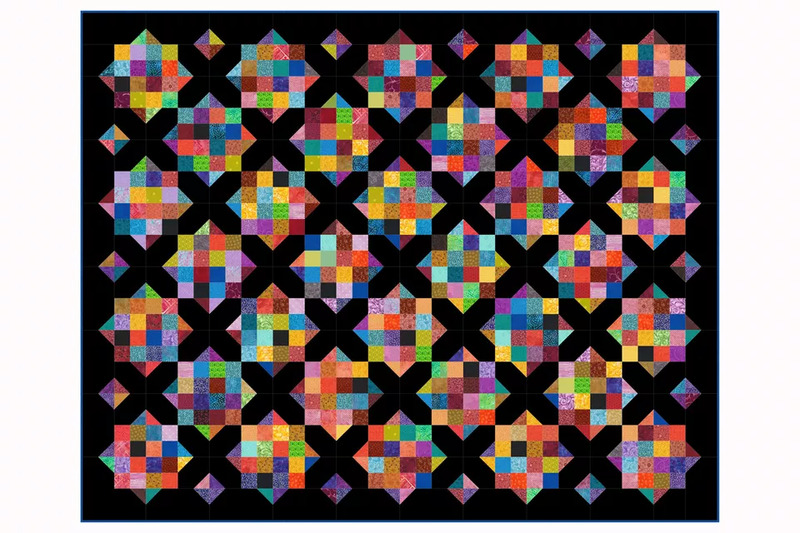 Make one additional X quilt block if you'd like to preview this type of layout.